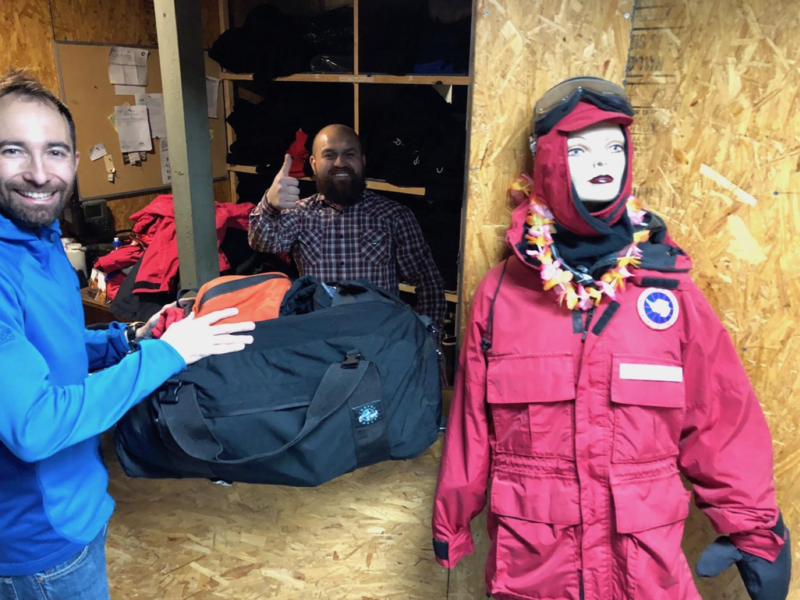 We spent our first day in Punta Arenas, Chile, getting heavy polar gear from the United States Antarctic Program (USAP), trying on parkas, hats, gloves, insulated bibs, boots, Gore-Tex pants, etc. We chose what fit us best to be prepared for the cold and wet weather awaiting us in the Antarctic Peninsula. The process was pretty quick with our new friend Paul assisting us. With appropriate clothing checked off the list, we visited the warehouse containing our gear (which was mostly already packed up in wooden crates or pallets for easy shipping) for some last minute instrument checks. Our flight to Rothera was delayed from Friday, November 16th, to Tuesday, November 20th. 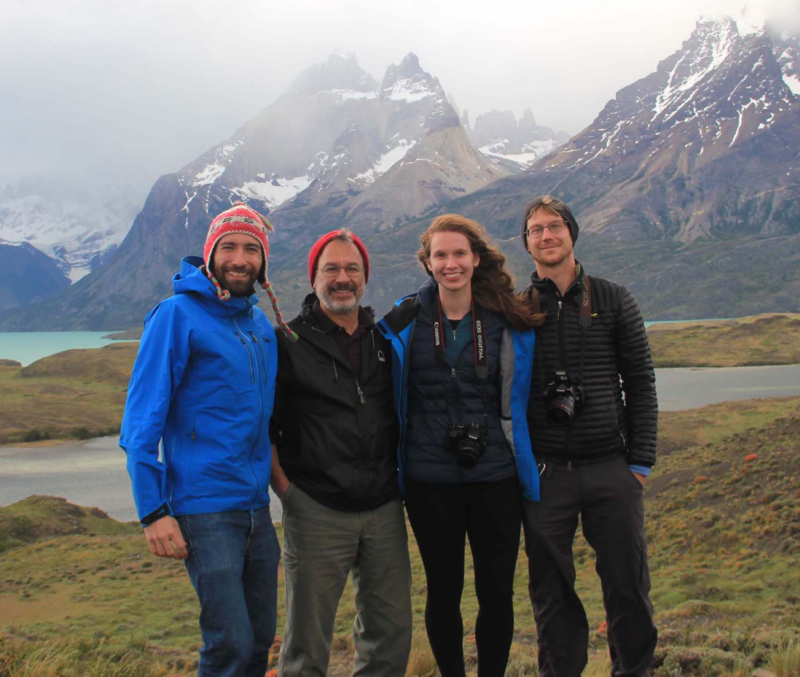 This meant the Firn Aquifer team (southern contingent) had some extra time to explore the local area, and what better place to go than to Torres del Paine National Park. We packed up some weekend bags and left all of our larger gear at the hotel for a mini-holiday. 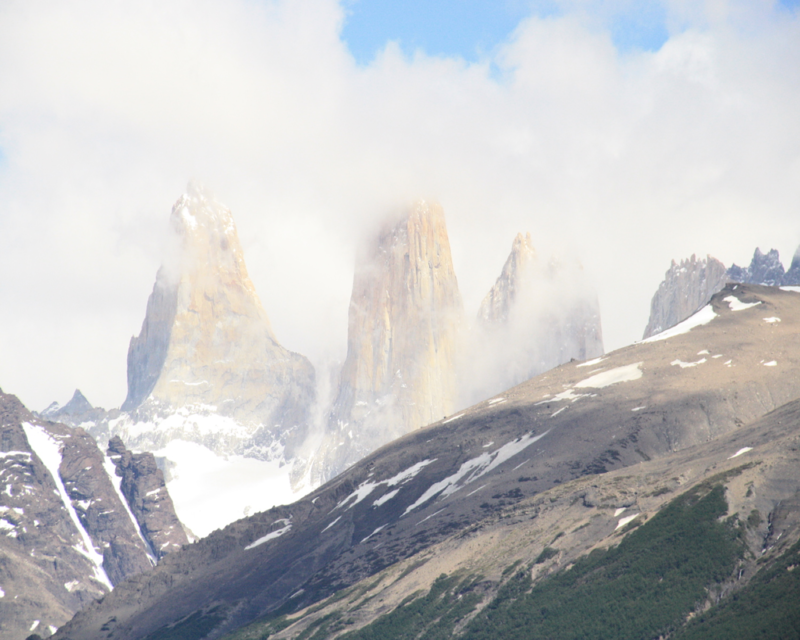 Torres del Paine near the town of Puerto Natales is about five hours north by car—or in our case, by trusty rental truck. The drive is long, and the landscape and its tumultuous weather, change by the minute. Fittingly, the road, Highway 9, is called Routa Fin Del Mundo—the road to the end of the world. We spent hours checking out stark and empty, but still beautiful scenery. And slowly, the terrain became grander. Emerging ahead was the landscape of Torres Del Paine—incredibly rugged spires, snow-capped mountains, and glacial blue waterfalls. Bright flowers, green shrubs, and eerie skeletal trees from a long-ago wildfire made every landscape picture a keeper. The lakes were a magnificent turquoise, carrying just a bit of glacial flour that lightened the color. The effect was ethereal with high ragged clouds shrouding the peaks as the sun began to set. 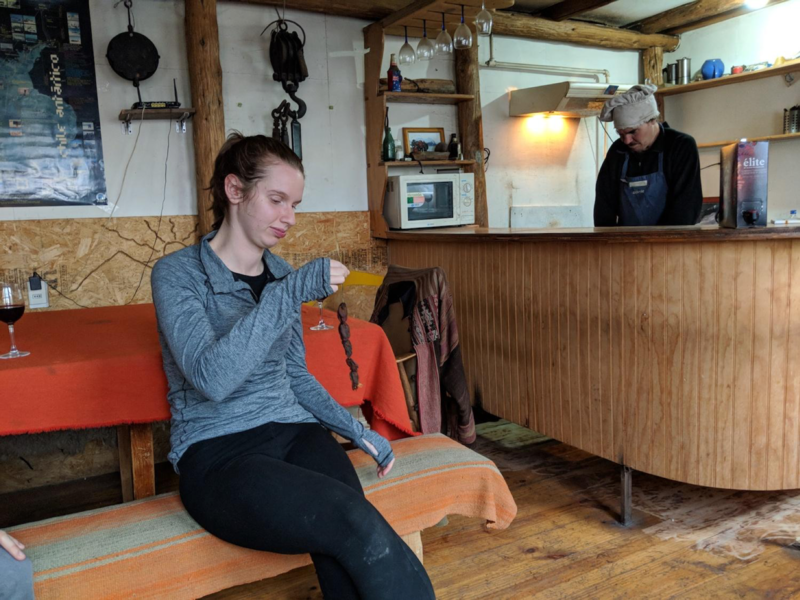 We headed back to our bungalow in Puerto Natales for the night and grabbed pizza (and wine) along the way to celebrate our adventures of the day. The next morning was spent doing a bit of work and catching up on emails followed by more adventuring in Torres del Paine. We saw more huge blue waterfalls, got a clearer view of the Towers finally, and hiked to an overlook with a view of Glaciar Grey, a mountain glacier just west of the Cordillera del Paine. Most of the roads in the park are narrow, winding, and unpaved, so although the travel was bumpy, the views made up for it tenfold. After another long day of adventuring, we headed back to our hostel, 4 Elementos where Rodrigo Traub, aka Mr. T, hosted us. Mr. T is a local mountaineer, Puerto Natales resident, and native Chilean with a very lovable dog, Perrita. He provided us with a delicious local dinner of salad and homemade stew including eggplant, potatoes, carrots, onions, rice, chorizo, smoked mussels, and—of course—plenty of wine. Mr. T told stories of his mountaineering days, being one of the first men to ever reach the summit pyramid of Cerro Paine Grande in the winter in 1996, while we relaxed by a warm stove that heats the hostel. We headed to bed, stomachs and hearts full, ready to return to Punta Arenas and begin the next leg of our trip to Rothera in the coming days. After a morning of corn-flour crepes, coffee, and fresh-squeezed orange juice, we headed back to Punta Arenas, but took a few back roads to stretch out the return. The drive turned into a mini-safari as we passed flamingos, a brown Patagonian skunk, a fox with a cloud of angry birds chasing it, and a flock of emus. The landscape has a look of desolation, but it teems with life. We returned to our hotel happy and ready for the next few days…and the flight to Antarctica. On April 6, Ted Scambos, Jenn Bohlander, and I will be flying to Punta Arenas, Chile to join researchers aboard the Research Vessel Araon, a South Korean icebreaker. 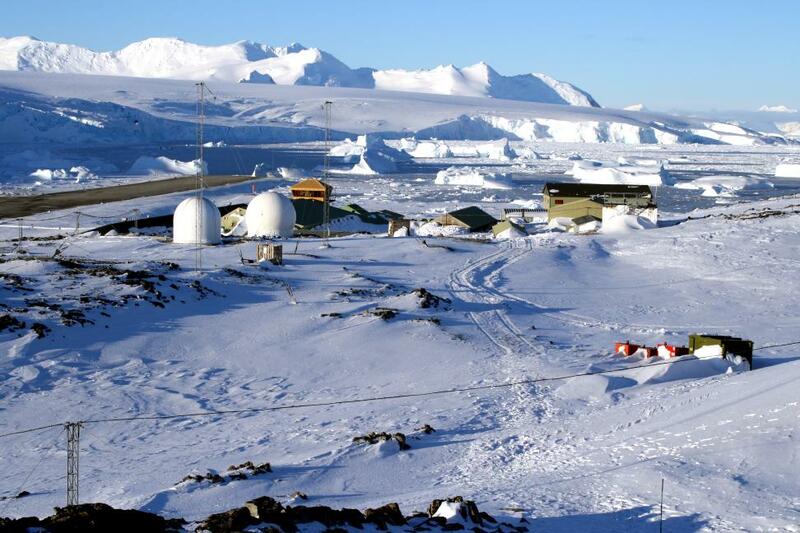 Our team will travel to the Antarctic Peninsula, sailing across the Drake Passage, to maintain the network of automated stations we installed over the last three years. Working with Erin Pettit and Ronald Ross, the team will also conduct radar surveys of the Flask and Crane glaciers. 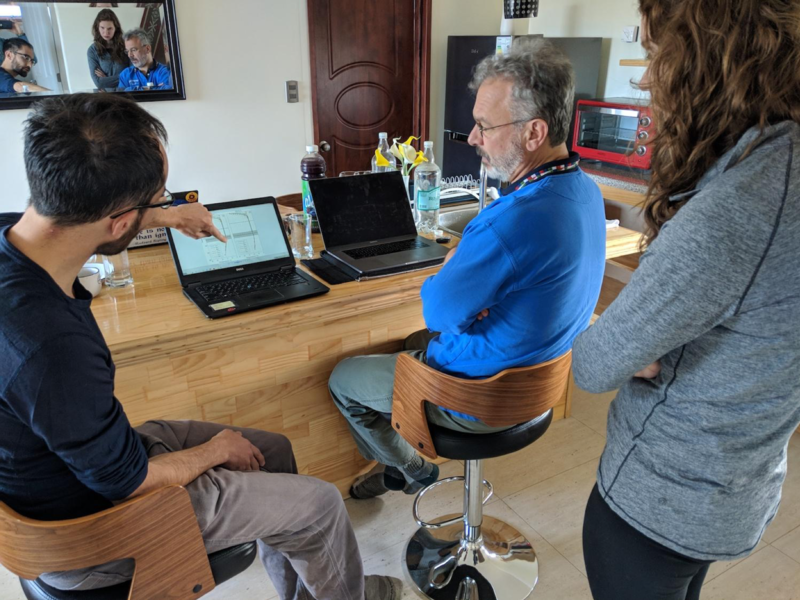 We are planning on assisting South Korean researchers in the installation of their observing stations–these “K-AMIGOS” will overlook the dynamic Crane and Flask glaciers, providing near real-time observations of ice conditions and weather information. Thu 12/20: Got on board the Dash-7 around 9:00 a.m. together with outgoing field operations manager Andy Barker, field assistant Roger Stilwell, scientists Beth Davies, Mike Hambrey, and Daniel Farinotti, and the flight crew of pilot Phillipe Leblanc and mechanic Chad Jones. We landed in Punta Arenas around four hours later. We were all staying at the Diego de Almagro hotel so we all piled into a van from the British Antarctic Survey (BAS) contractor AGUNSA. Later that afternoon, we all visited station support assistant Neil Malcolm who had injured his back skiing a couple of weeks earlier, and was making a fantastic recovery at a local hospital. Made a quick visit to the DAMCO warehouse to check on batteries. That evening I joined the other Dash-7 passengers for a fine dinner at La Marmita as they were all flying out of Punta Arenas early the next morning. Fri 12/21: Went over to the DAMCO warehouse and, with the help of a couple of AGUNSA workers, located the two batteries in the AGUNSA warehouse that I had tried to give Chris Hill of the Lake Ellsworth drilling project that he was unable to use. Added these two to the other six we had found in the DAMCO warehouse back in October. Arranged with Dave Morehouse to have these eight batteries sent to Tamsin Gray in Rothera on the next Gould cruise to back fill the five she had given me, plus to pay back Rothera for the other materials (poles, brackets, etc.) I had acquired during my stay. Sat 12/22: Logged into AMIGOS-6 from the hotel, updated some program files, and downloaded the first two Sony images of the work crew. Posted the Sony images and sent an email to Ash Fusiarski pointing him to the images. Checked out of the hotel and walked over to the DAMCO warehouse. Met the DAMCO liason Marcella, loaded my gear into the DAMCO van, was driven to the airport, and was assisted by Marcella through the baggage check-in procedure including the payment of excess baggage charges. The flight to Santiago with a short stop in Puerto Montt was uneventful, as was the 4-hour layover in Santiago. I boarded my flight to Dallas at 10:30 p.m. The first Sony camera images of the repair team (minus Terry) captured by AMIGOS-6. Left to right: Phil Harle, Jim Scott, Ash Fusiarski, Ian (Cheese) Rudkin, and Al Howland. Sun 12/23: The ten-hour flight from Santiago to Dallas was also uneventful. Made it through customs ok and even had time for some breakfast. Flew on to Denver arriving at 9:45 a.m., and just made it to the 10:25 a.m. bus to Boulder. My son Alex picked me up at the Table Mesa Park-n-Ride and, after a quick visit with my wife Sue at home, I dropped off my equipment at NSIDC. Ted was at work (of course) and he congratulated me on a successful field season. Mon 12/24: Sometime between 2012/12/23 2000 UTC and 2012/12/24 1200 UTC, a 1000-foot iceberg calved off the ice shelf about 2 miles from AMIGOS-6 on Cape Disappointment. The right side of these AMIGOS-6 images show a 1000-foot iceberg calving off the ice shelf 2 miles southwest of the AMIGOS-6 tower. The event occurred between the time the second and third images were acquired. The earlier first image and later fourth image are included because they have better illumination. 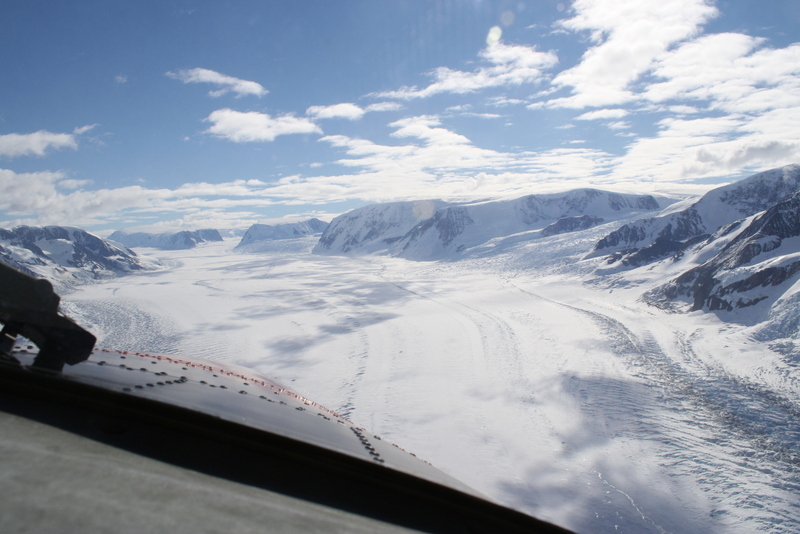 Looking out to the west on the Dash-7 about 20 minutes before landing in Rothera Research Station. I attended a short Dash-7 flight briefing at the Almagro with my twelve fellow passengers. Then they all piled into two vans, while I got VIP treatment again as the sole US Antarctic Program/DAMCO passenger to the Punta Arenas airport, this time with Octavio and a driver. 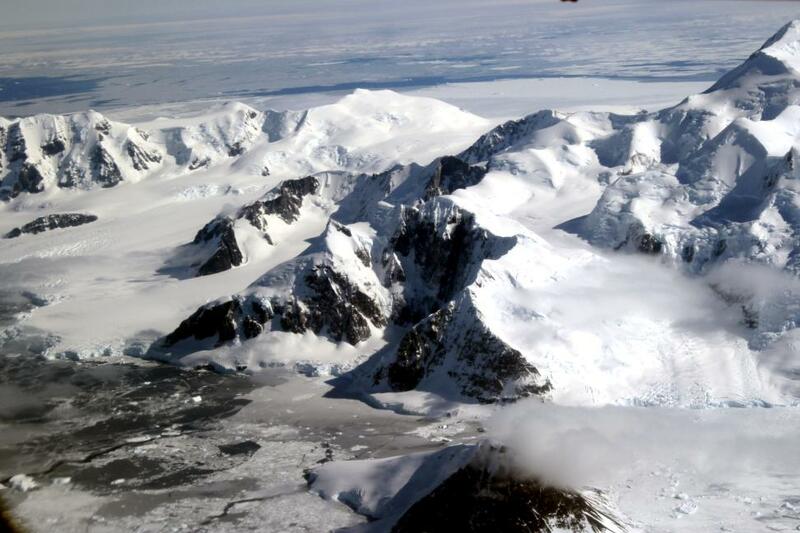 The four-hour flight to Rothera was uneventful until the final half hour or so when the Antarctic Peninsula and Adelaide Island sea ice, glaciers, and mountains came into view and people crowded around windows to take photos. Got off the plane. Shook hands with Clem Collins, the aircraft operations chief who I had met during my previous visit to Rothera in January and February 2010. Following a brief orientation meeting, I touched base with science liaison Tamsin Gray, met my designated field assistant Malcolm Airey, and moved into my room in Giant house. My roommate is Mike Hambrey, who works with glacial geomorphologist Neil Glasser. I am to share a science office in Old Bransfield with Daniel Farinotti, who will also be doing GPS and radar work on Scar Inlet as well as on Starbuck and Flask Glaciers. Took a short walk around the point and took a few photos. Lots of snow on the ground and lots of sunshine here. Got training all day tomorrow and part of Friday. Rothera station looking north from the top of Memorial Peak during my walk around the point. A set of eight batteries left over from the 2010 Nathaniel B. Palmer LARISSA cruise that are to be sent to Rothera Research Station to replace any British Atlantic Survey batteries that I use on my current trip. Went for a bit longer run northeast of the hotel along the ocean highway. Walked over to the AGUNSA warehouse, which is next door to the DAMCO warehouse and is being used for staging the equipment for the Lake Ellsworth crew. Their leader, Chris Hill, asked if I had any extra batteries. I said I need five myself and would check back with him. Back over at DAMCO, I met Gene Domack who had arrived on the Lawrence M. Gould (LMG) icebreaker around three in the morning. We started looking for some of Gene’s batteries that he had unloaded that morning off the LMG, but we immediately found a set of eight batteries with a C-514 TCN label assigned to Ted Scambos that were from our 2010 LARISSA Palmer cruise. I gave two to Chris Hall of the Lake Ellsworth drilling project, so when they make their big discovery of unique bugs in the lake this season, we can say, “Those guys used some of our batteries!” Chris was going to charge and test them, and let me know if they are okay. He and his crew will be stopping in Rothera next week. Took a nostalgic tour with Chris Linden of DAMCO to the Nathaniel B. Palmer (NBP) icebreaker, which is in Punta Arenas until January. Got invited to the end of cruise dinner at Mamasita’s, drank too much wine, crawled to a couple of bars with the dwindling LMG crew, and staggered back to the hotel around 2:30 a.m. Took a fifteen-minute walk to the DAMCO warehouse from the hotel and met Octavio, Gonzalo, and Paul who helped me check out my Extreme Cold Weather (ECW) clothing. Gonzalo gave me my Iridium satellite phone, and Marcella brought me my four cases, which she had kept in the DAMCO van overnight since the warehouse was closed. I was told that I wouldn’t be flying the next day due to delays in some British Atlantic Survey arrivals to Punta Arenas. Bought some crackers, cheese, cookies, and fruit at the local Unimarc, tested my satellite phone with a quick call to Sue, and the spent then entire evening until 11 p.m. watching the CNN International coverage of Hurricane Sandy as it came ashore. Slept a few hours on the eight-hour flight to Santiago. I arrived a little over an hour before my scheduled departure to Punta Arenas. I located Jimmy, my DAMCO facilitator, after a few minutes of waiting in line. He performed his usual magic, waiving me through immigration, customs, and baggage transfer. Luckily I was his only customer that day, so I made my flight just as boarding had started. Arrived in Punta Arenas on time, at 2:00 p.m. local time. Picked up by a DAMCO representative named Marcella and a contract driver and was whisked to Hotel Diego de Almagro. While unpacking, I discovered that I had left my mittens in Boulder and my MP3 player (containing several books lovingly downloaded by Sue) on the Punta Arenas flight. Went for a one-hour windy run, showered, and went to the hotel dining room for dinner where I found a table of ten Brits. All the men were on the British Antarctic Survey Lake Ellsworth drilling team. The lone lady was Karen Fowler, a Rothera communications assistant who should have left on the Dash-7 flight south Sunday morning, but had a slight cold, and so was resting and waiting for my flight.